Lexli International, Inc. skincare company provides pharmaceutical-grade, potent Aloe-based skincare products to international skincare professionals and consumers. Founded in 1996 by Dr. Ahmed Abdullah, a board-certified plastic surgeon and nationally recognized aloe researcher, Lexli® offers a line of professional skin care products created to achieve healthier, younger-looking skin. All Lexli product formulations, including AloeGlyC®, the brand’s patented and celebrated daily exfoliant, and the Lexli Acne Kit, the most potent and focused over-the counter acne treatment available, are developed with certified organic, pharmaceutical-grade aloe vera as their principal ingredient. Formulations incorporate additional natural ingredients, including pH-balanced humectants, masking agents, protectants and botanicals. For more information, please visit www.lexli.com. A trendsetter in the beauty market, innovative skincare brand Lexli International is leading the way with a line of skincare products supported by scientific research and formulated with a base of certified organic, pharmaceutical-grade aloe vera, one of the most clinically effective natural ingredients in the world. Through meticulous research and development, scientific advances, professional expertise and the understanding of a customer’s well-being, Lexli is continuing to change the world of beauty. All skincare products start with a base. Most over-the-counter and physician dispensed moisturizers and exfoliants are water-based. In fact, 99% of the skincare products on the market today start with water as the base then add other ingredients to make the product. There’s just one problem – not only does water dilute the active ingredients, your skin cannot absorb water. The first step of any skincare regimen is cleansing, which can be done with any mild cleanser. In order to keep the skin healthy and looking good, use enough product to eliminate any grime, sebum, dead cells, make-up and other particulate matter that may build up on your skin after a day’s exposure to the environment, thereby encouraging bacterial growth and skin cell decay. o Lexli’s Aloe-Based Cleansing Lotion is designed to unclog pores and remove impurities. The special ingredients work to cleanse the skin and leave it feeling soft, silky and refreshed. A noticeable improvement in the suppleness of the skin can be achieved soon after the very first use. Lexli’s Aloe Based Cleansing Lotion is pH-balanced, non-greasy, and soothing for sensitive and traumatized skin. The second and most important step in the skincare process is exfoliation. Exfoliation is the removal of dead skin cells and debris (keratin) from the skins surface that otherwise covers up the new, living, vibrant skin cells underneath. When keratin builds up, it can clog your pores. Removing the keratin promotes new collagen production, resulting in healthier-looking skin. According to Dr. Abdullah, “a popular skincare myth is that exfoliation should occur with products that contain ‘gentle exfoliants’ such as microbeads or microspheres. The truth is that there is no gentle way of removing the thickened layers of keratin.” For effective exfoliation, Dr. Abdullah recommends skin stimulation by either a chemical reaction or by vigorous mechanical dermabrasion. o Lexli’s Aloe-Based AloeGlyC Renewing Exfoliant combines Aloe Vera, Glycolic Acid and L-Ascorbic Acid beads (Vitamin C) to help remove dead skin cells while activating collagen production – the skin’s natural rejuvenation process. The process is virtually as effective as a doctor’s office peel and results in fewer fine lines and wrinkles and enhanced skin texture and clarity. AloeGlyC’s tiny Vitamin C beads also function as biological cofactors and antioxidants to protect the skin from environmental damage. AloeGlyC is gentle to the skin, yet extremely effective. With consistent use, AloeGlyC can minimize pore size, diminish the appearance of fine lines, wrinkles and other signs ofpremature aging; diminishes blemishes and reduces the potential for future breakouts; evens the overall skin tone and skin clarity; and helps fight dryness. Lexli’s skincare products help the skin keep its water content at optimal levels through the use of humectants: molecules that hold more than their own weight of water within their molecular and chemical structure. When applied to the skin, humectants concentrate water, minimizing evaporation. The presence of water on the skin surface plasticizes and smoothes the uppermost layers of the skin and temporarily soothes the discomfort associated with dry, tight skin. Lexli's moisturizers can increase water retention in both the upper and lower layers of the skin, not only by preventing evaporation, but also by stimulating the synthesis of essential skin proteins and oils. o This gentle skin toner contains natural, moisturizing humectants that restores the skin’s natural pH, removes any traces of cleanser or skin cell build-up, and adds moisture without causing surface dryness. Lexli’s Aloe-Based Tone and Balance leaves the skin feeling refreshed, hydrated and ready for the application of moisturizer. It is alcohol-free and can be used to also calm the irritation caused by shaving or waxing, as well as irritation caused by sun exposure. o Lexli’s Aloe-Based Night Moisturizer is a nourishing, humectant-enriched cream designed to replenish the loss of moisture within the skin’s tissues. The strong humectants and masking agents, such as collagen, work overnight to preserve and restore the skin’s natural moisture level and revive the skin’s tension and firmness.. The final step in any proper skincare regimen is protection against environmental factors. Exposed skin can be damaged by ultraviolet light, which can contribute to premature aging of the skin. o Lexli’s Aloe-Based Day Moisturizer with SPF 15 is a light, non-greasy formula that moisturizes and conditions to leave the skin feeling extraordinarily soft and comfortable throughout the day. It protects your skin from the environmental factors that cause premature aging with an added SPF 15 which helps to shield the skin from harmful UVB and UVA rays. You have to tell us in your comment as to why you would like to win Lexli skin care kit and whether you find aloe based products more effective than others. You should also fulfil any one of the conditions (rules) from (1) to (8) and mention that in the same comment. Commenting on the post by fulfilling at least one rule and with a valid email address or your twitter id is absolutely necessary to let me know what you did to enter this contest. Leave links wherever applicable. Also remember that without fulfilling the mandatory requirements, all other entries will be considered invalid. For extra entries, leave separate comments for each entry to increase your chances of winning. The giveaway ends on May 8, 2011 and is open to entrants in the 50 United States only. One lucky winner will be chosen through random.org and the results will be announced on May 9, 2011. I am an email subscriber to your daily updates! I "Like" post on Facebook. I "Like" Beauty and Personal Grooming-A resource for natural beauty tips on Facebook. Lexli skin care kit has the promise of caring for my aging skin. The hummingbird's love the aloe vera flowers. The aloe vera plant is a legendary healing plant. I would like to win the Lexi kit for my sensitive skin. Aloe based products seem more gentle without any irritation. I don't remember a specific aloe based facial product I have tried but I know my aloe plant works on cuts, scrapes and burns, so I'd love to try the Lexli products. I think that aloe should be a no-brainer but is frequently overlooked. We have all used it for burns and after sunning - use in a skincare regimen sounds very exciting. I love those skin care starter kits because I can try out the products without spending too much money. I haven't used aloe base products for a very long time, but those products feel so good and refreshing during the summer, and it doesn't cause breakout, so that is a plus for my combination, acne-prone skin. I do find aloe based products work better. I would like to win the Lexli skin care kit because aloe vera is good for so many skin irritations and maybe it will help with my adult acne. I've not tried an aloe based product before. I would love to win this because I think the aloe base would be gentle on my skin and I have never used aloe based products before but I hope the healing properties would help my acne scars heal! I love to try new skin care products. I would love to win this giveaway!! I ould like to win this because, I have read other reviews that have been great about this product. Yes, I do think that products that contain aloe are better because of its healing properties. 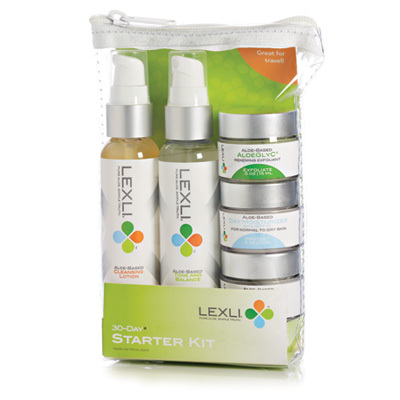 I would like to try this Lexli starter kit because I enjoy trying new beauty products and would like to see how it works. I like that it has SPF in it too. I find products with aloe vera to be effective, at least those used for hand cream. Have not tried in facial products. Love to win this because my skin could use some good skincare pampering that has good stuff in it! I would like to win this as I'm frustrated with my current skincare, which is irritating my skin. This sounds really natural and soothing. I always find products with aloe to be more soothing than those without. I am an email subscriber to your newsletter. I keep an aloe plant on the windowsill to treat burns so I know aloe has to be good for your skin. As a child my grandmother had an aloe plant and swore by it, she looks 50 years young even though she's 70 years young ;) I would love to try this because even though I'm almost 30, my feel seems run down and needs a little refreshing and I know the Toner would help me with this, I know Aloe is natural, I'm always surprised when I read the labels how many things are in there I can't pronounce and makes me wonder is this why at almost 30 my skin is still breaking out? I would like to win the starter kit because I'm always on the lookout for a better skin regimen. I like aloe-based products, they do seem to be effective. I would like to try these products because I am in need of a new skin care regimen; the one I'm using now does not work very well. I cannot recall using any aloe based products. I subscribe to your weekly updates. I like this post on Facebook as Debbi Otto Wellenstein. I like you on Facebook as Debbi Otto Wellenstein. I'd like to try this to help my dry and aging skin. I have read a lot of promising things about aloe products. I have problems with acne and flaky skin. These products sound like they might really help! I like aloe-based products because they seem to help prevent the red marks left behind by blemishes. I am an email subscriber to the Feedblitz weekly updates. I am a public follower of this blog with Google Friend Connect. I shared this giveaway on Delicious. This blog is in my blogroll. I like Beauty and Personal Grooming on Facebook. I'd like to win because my skin is in need of help. Aloe products seem to soothe more.. I have sensitive and aging skin, and know that aloe has many moisturizing properties, and is used for burns.